At Lake Dental, we also offer dentures as a form of high-quality and affordable restorative dentistry. Our wide variety of dentures can replace several missing teeth at once, resulting in a smile that is both comfortable and durable. Our dentures are also made in our local and trusted lab, allowing them to be expertly-fitted to blend in seamlessly with your smile. With unique colour-matching precision, our patients are always pleasantly surprised with their results! Your denture process begins with an initial consultation with our professional dentist, where impressions will carefully be taken of your teeth. These are then sent to our dental lab, ready to be expertly-crafted to precision. If you require partial dentures, the denture will be fitted to your existing teeth using secure, yet comfortable clasps. Alternatively, if you require full dentures, we will begin the procedure by performing the necessary dental extractions and providing you with a temporary denture as you heal. 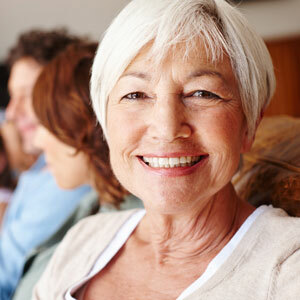 Did you know that dentures can also be secured using dental implants? Using as little as two to four implants, you can now enjoy more comfortable and secure dentures. This is a great option for those who currently have dentures which are loose or affect their daily lifestyle, including how they chew and talk. Thankfully, it isn’t necessary to have an implant fitted for every missing tooth. Instead, our experienced team use pairs or sets of implants at once to support fixed dentures. This not only saves the patient additional surgery time, but also maintains a more affordable treatment cost. If you’re considering dentures as a restorative option, or wish to swap your old, loose dentures for the stability and comfort that implant supported varieties offer, please schedule a complimentary consultation with our dentist to learn more!